Located on the high plains of northeastern Colorado, Greeley is the county seat of Weld County and is a city of just over 100,000 people. The city is less than an hour away from the Rocky Mountains, and panoramic views of the mountains can be seen from high points throughout the city. Much of Weld County is agricultural with irrigated farmland, prairie grasslands, and livestock operations. Greeley hosts the University of Northern Colorado, a 12,000-student state university, which provides undergraduate and graduate degrees in more than 100 programs. The community is also home to Aims Community College with 160+ degree and certificate programs, as well as continuing education opportunities. We are a community of parks -- more than 40 -- that offer walking paths, picnic shelters and open spaces. Includes Cities/Towns: Ault, Brighton, Eaton, Evans, Greeley, Johnstown, Kersey, Milliken, Windsor. There is so much to do that you'd be tired if you tried to do everything! 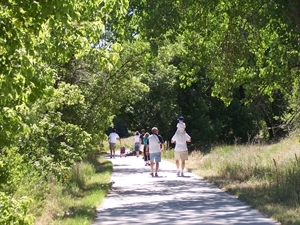 One of the gems of our area is the Poudre River Trail, a concrete trail that extends 21 miles across the north edge of Greeley and west to Windsor. Several trail heads allow access to the trail at different points so that distances traveled by walking, bicycling or running can be tailored to the individual. Our festivals include Blarney on the Block, the UNC/Greeley Jazz Festival, Cinco de Mayo, Greeley Blues Jam, Greeley Stampede, Arts Picnic, High Plains Chautauqua, Oktobrewfest and the Festival of Trees. Our Greeley Lights the Night holiday parade attracts thousands. Two municipal golf courses are considered among the finest in the state, and our city-owned recreation centers offer Silver Sneakers programs for seniors. There are restaurants to suit every palate. From May - September, Greeley's downtown hosts outdoor concerts every Friday night. In addition, other outdoor concerts occur at the University and at various city parks. Greeley’s entertainment options offer something for all audiences, no matter their age or background. The Greeley Philharmonic Orchestra has performed every year since 1910. Only 27 other orchestras in the nation can claim such longevity. The smaller Greeley Chamber Orchestra presents new concerts each year, often joined by its Chamber Choir. With a history approaching 50 years, the audition-based Greeley Chorale sings a repertoire that includes classical, contemporary, and religious and holiday choral works. Community theatre is alive and well in Greeley, as performed by the Stampede Troupe, with musical, comedic and dramatic productions. All quality entertainment deserves a quality venue. The Union Colony Civic Center provides the 1,665-seat Monfort Concert Hall and the intimate Hensel Phelps Theatre, with capacity for a 220-person audience. In addition to the community entertainment performed there, the UCCC schedules a full season of Broadway touring companies, national and international talent in music, comedy, children’s theatre and dance. The University of Northern Colorado enhances our community’s entertainment scene with its College of Performing and Visual Arts. Its programs in drama, musical theatre and opera theatre delight audiences year round, including summertime’s Little Theatre of the Rockies. The internationally recognized music program includes vocal and instrumental performance and jazz studies. UNC also presents an international film series open to the community. During the summer and fall, Greeley’s downtown presents live music every weekend, within the first “go-cup” district in the State of Colorado. A number of Greeley’s bars and restaurants also feature live music on a regular basis. Throughout the summer, one can find a variety of performances at outdoor venues, such as UNC’s Garden Theatre and local parks. Ever since Greeley was founded as a utopian community, our city has placed strong emphasis on the arts. In fact, Greeley was the first city in the nation to have a Culture Director. The City of Greeley sponsors Art in Public Places through its Sculpture on Loan program in our parks and plazas, “1% for Art” in every capital project, and city-owned gallery spaces. The city also owns an art collection of both indoor and outdoor art valued at $1.6 million, acquired since 1967, and acknowledges exceptional architectural design each year. A section of Greeley has been recognized by the State of Colorado as a Creative District, which integrates the historic Downtown and University Districts in a continuum of dynamic and complementary uses. Greeley-Evans Transit offers a fixed route system that traverses the community and serves most residential, commercial and medical service areas, including an outpatient VA clinic. GET also provides a demand response service for the disabled and elderly. Bus service connections are available to Denver, CO and Cheyenne, WY, where transcontinental buses can be boarded. The community is served by two taxi companies. Travelers at Denver International Airport, approximately 50 miles southeast of Greeley, can access shuttle service and rental cars. Greeley enjoys an abundance of healthcare options, including service by three nationally-recognized healthcare systems - Banner Health, Kaiser Permanente and University of Colorado Health. From our state-of-the-art 378-bed acute care hospital to a wide array of medical and holistic specialists, residents can access every level of care. The VA Outpatient Clinic is served by local bus transportation. For emergency care, you’ll find three emergency care facilities, including one Level II Trauma Center, located in different areas of the city for easy ambulance access. Emergency helicopter transport is also available to take advantage of precious time from outlying areas. There are also four Urgent Care centers, for immediate non-emergency care. Hospital-based cancer and cardiovascular programs provide care beyond that available at our many physician specialist offices. Physician offices offer an area of specialties: ENT, Gastroenterology, OB/GYN, Orthopedics, Rheumatology, Pediatrics and Opthalmology to name a few. Our community also has some excellent Family Practice clinics, as well as a Family Practice Residency Program and Nurse Training Program. Greeley offers three surgery centers for general and specialty surgery. Jan 16.4 F° 31.0 F° 45.6 F° 0.5 "
Feb 19.3 F° 34.4 F° 49.4 F° 0.4 "
Mar 27.2 F° 43.0 F° 58.9 F° 1.2 "
Apr 34.4 F° 50.7 F° 67.0 F° 1.8 "
May 44.3 F° 60.1 F° 76.0 F° 2.4 "
Jun 52.4 F° 69.2 F° 86.0 F° 1.9 "
Jul 58.3 F° 75.7 F° 93.0 F° 1.7 "
Aug 56.4 F° 73.2 F° 90.0 F° 1.5 "
Sep 47.3 F° 64.7 F° 82.0 F° 1.1 "
Oct 35.4 F° 52.3 F° 69.2 F° 1.0 "
Nov 24.4 F° 39.5 F° 54.5 F° 0.7 "
Dec 16.2 F° 30.4 F° 44.6 F° 0.6 "
Greeley enjoys a semi-arid, steppe climate with hot summers and primarily mild winters. Relative humidity is low year-round, with dew points rarely exceeding 60° even at the height of summer. Lots of sunshine and fairly little precipitation make for a pleasant climate year-round. Precipitation is mostly in the form of snow from October to April, but snowfalls are often light and usually melt within a few days. The area did experience what some have called a 100-year flood in 2013, created by uncharacteristic heavy rains, but flooding was confined to areas close to rivers. We occasionally receive tornado warnings in the summer. Condos Over 50 Communities Greeley’s neighborhoods are as diverse as the people who live here. You can find homes on the Historic Register, plus innovative new construction, and everything in between. Home ownership options within Greeley include single family residences with private yards, maintenance-free patio homes, attached townhomes, lofts, condominiums, and even horse properties. Rural farm and ranch properties are bountiful throughout the county. Home care Senior center Visiting nurses Multiple non-profit organizations also provide senior services through companionship, transportation, and in-home assistance. Abundant volunteer opportunities exist with North Colorado Medical Center, the Union Colony Civic Center, Retired Senior Volunteer Program and United Way's Volunteer Resource Center. Greeley has recently been recognized as having the highest job growth in the nation, primarily due to increased oil and gas development in the region.